Caffeine is perhaps the most popular stimulant in the world. It's contained within 3 of the most popular beverages the world has ever seen; coffee, tea, and yerba maté. 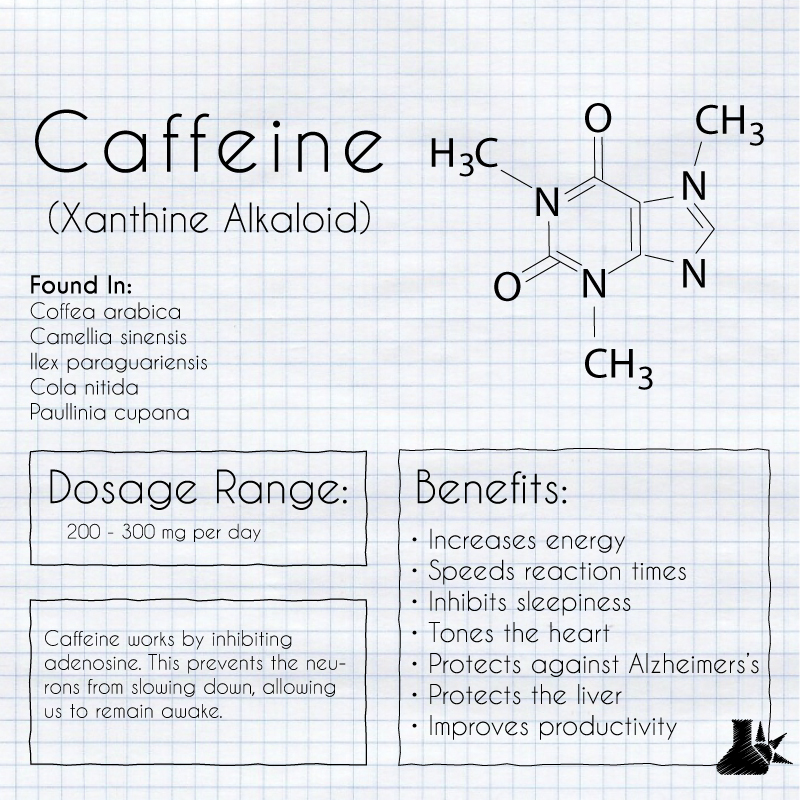 Caffeine is an alkaloid that works mainly by competitively inhibiting adenosine on our neurons. Adenosine normally acts to slow the firing of our nerves, resulting in sleepiness. When caffeine inhibits these from taking action, it effectively inhibits our tiredness. Although not technically a nootropic, caffeine is a useful addition to nootropic formulas for its ability to give us faster reflexes, stimulate the CNS, and keep us awake when we would typically be feeling tired. Multiple species of plants contain caffeine, including coffee (Coffea spp. ), tea (Camellia spp. ), jola nut (Kola nitidia), guarana (Puallinia cupana), yerba maté (Ilex spp.). Caffeine can also be synthesized quite easily in a lab. Equivalent to 3-4 cups of coffee split up throughout the day. Best taken with L-Theanine and/or Theobromine. Caffeine is a colorless, odorless, white chrystaline powder. One method of extraction is to boil coffee beans in water with lime or magnesium oxide to precipitate tannins and coloring matter. Charcoal may be used to remove other coloring agents, and the caffeine will rechrystalize out of the hot water easily. .
Another method is to use supercritical carbon dioxide or obtain byproduct of decaffeinated coffee or teas. . Despite previous reports online, there is no evidence for caffeine being a carcinogen. Synergy with related alkaloid theobromine, and amino acid L-theanine.